North Korean leader Kim Jong-un arrived in Beijing on Tuesday for talks with Chinese President Xi Jinping to chalk out his next course of action after his historic summit with United States President Donald Trump where it was agreed to denuclearise the Korean peninsula. The visit, Kim’s third since March, is taking place amid sharp escalation rhetoric between Beijing and Washington over tariffs almost spiralling into a trade war. Kim, who visited Beijing twice earlier before his Singapore summit with Trump, arrived by air to meet the top Chinese leadership. “Kim Jong-un, chairman of the Workers’ Party of Korea and Chairman of the State Affairs Commission of the Democratic People’s Republic of Korea visits China from June 19 to 20,” a brief announcement by state-run Xinhua news agency said. For his part, Chinese foreign ministry spokesman Geng Shuang parried several questions on Kim’s visit and its purpose saying details will be released in a timely manner. Geng was not forthcoming when asked whether China will join Russia in calling for lifting of United Nations sanctions against North Korea in the light of the Singapore summit. “China stands against the unilateral sanctions outside the UNSC. This position is very clear. We believe that sanctions itself is not an end and all parties should support and coordinate with the current diplomatic efforts and dialogue to work hard for denuclearisation and political settlement of the Korean peninsula issue,” he said. 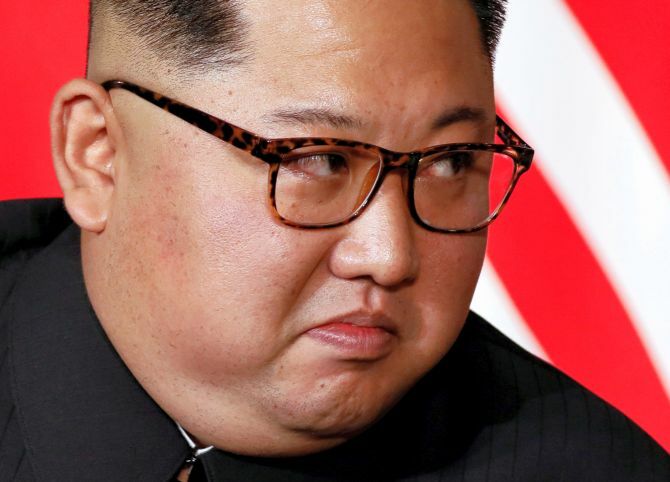 The UN Security Council imposed a series of economic sanctions against North Korea after it conducted its first nuclear test in 2006, crippling Pyongyang. Since he took over, Trump piled pressure on China to stringently implement the UN sanctions which many believe led to Kim agreeing to scale down his nuclear programme leading up to the summit with Trump. Despite reports of differences, China remains a close ally of North Korea. Besides visiting Beijing twice before he met, Kim travelled by an Air China flight to Singapore for the summit with Trump signifying close ties between Beijing and Pyongyang. Officials say his visit was expected to crystallise the next course of action by him to announce the denuclearisation process and further steps on the Korean peninsula. Kim’s visit this time here is taking place amid escalating trade tensions between the US and China with the two countries already announcing tariffs up to $50 billion each while Trump is threatening more sanctions. For its part, China has been warning of strong retaliation. Sue Mi Terry, a Korea expert at the Centre for Strategic and International Studies, told the Hong Kong-based South China Morning Post that Kim’s recent engagement in diplomacy with frequent visits to China and meetings with Xi, rather than phone calls, made sense. China was also briefed by US Secretary of State Mike Pompeo about the Singapore summit during his recent visit here. After his talks with Chinese Foreign Minister Wang Yi, Pompeo stressed “the importance of China being a constructive participant in the next steps” after the Trump-Kim summit. “There remains hard work” and “difficult days” in denuclearisation negotiations with North Korea, Pompeo had said. During a joint press conference with Pompeo, Wang said China would like the US and North Korea to see the summit as “a new starting point” from which they can “maintain a momentum of dialogue and consultation, accommodate each other’s legitimate concerns, and work with other parties to advance the process of denuclearisation and the political settlement of the peninsula issue”. “China will continue to play a positive role in this process,” Wang added.